A computed tomography scan with contrast revealed no pulmonary emboli, multiple small pulmonary nodules, a hyperinflated right lung crossing the midline, and patchy opacity of the left lower lung, consistent with atelectasis. A = anterior; P = posterior. Severe pulmonary hypertension led us to recommend surgery in the face of progressive Swyer-James syndrome. A 50-year-old African American woman presented to the Emergency Department with worsening pain over her left flank, chest, and back. The pain had been getting worse, especially in the morning, over the previous couple days and was described as “nonradiating and sharp.” The pain would only last for a couple of minutes before subsiding. The patient also described worsening shortness of breath brought on by mild exercise. She denied dizziness, headaches, paroxysmal nocturnal dyspnea, or edema. The patient was hospitalized a month before with a similar presentation and was subsequently diagnosed with pulmonary hypertension. She was treated with sildenafil but could not tolerate the medication because of side effects. She was instead maintained on home oxygen and an albuterol inhaler. The patient denied smoking or alcohol or drug use. Her family had a strong history of hypertension, in her sister and mother. Her past medical history included Swyer-James syndrome, pulmonary hypertension, glucose-6-phosphate-dehydrogenase deficiency, and gastroesophageal reflux disease. In the Emergency Department the patient had a temperature of 98.4°F, blood pressure of 173/80 mm Hg, heart rate of 70-80 beats per minute, respiratory rate of 18-20 breaths per minute, and an oxygen saturation of 94% on 2 L of oxygen via nasal cannula. Upon examination the patient was in mild discomfort from pain over her left flank. She had severe kyphosis of her thoracic spine. Cardiovascular examination revealed regular rate and rhythm and a hyperdynamic and laterally displaced point of maximal impulse. Auscultation of her lungs showed diffusely decreased breath sounds on the right and crackles over the left mid-axillary line. Upon percussion of her chest her right side was hyperechoic, but her left was dull sounding, especially over the mid-axillary line. Examination of her extremities revealed convexity of her nailbeds but no swelling or edema. Notable laboratory study results included a hemoglobin concentration of 10.3 mg/dL, a mean corpuscular volume of 84.5 fL, a brain-natriuretic peptide value of 24 pg/mL, and a troponin value of <0.03 ng/mL. Arterial blood gases showed a pH of 7.42, pCO2 of 53.00 mm Hg, pO2 of 100 mm Hg, bicarbonate of 34.4 meq/L, and percent oxyhemoglobin of 96.2%. An electrocardiogram showed normal sinus rhythm with right axis deviation but no significant changes from previous electrocardiograms. An echocardiogram performed 1 month before admission revealed a dilated right ventricle with moderate systolic dysfunction, tricuspid regurgitation, right atrial dilation, and wall motion abnormalities consistent with McConnel’s sign. Additionally, 1 month ealier a right heart catheterization showed a right ventricular pressure of 68/8 cm H2O, a pulmonary capillary wedge pressure of 10 cm H2O, and a pulmonary artery pressure of 60/32 cm H2O. A chest x-ray was ordered, which showed hyperinflation of the right lung and increased density of the left lung due to right lung mass effect, but no pleural effusion or pneumothorax. 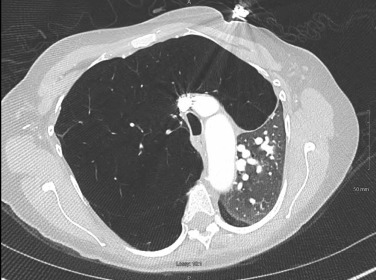 A computed tomography scan with contrast was subsequently ordered (Figure), which revealed no pulmonary emboli, multiple small pulmonary nodules, a hyperinflated right lung crossing the midline, and patchy opacity of the left lower lung, consistent with atelectasis. A ventilation–perfusion scan was also ordered to further evaluate lung function. The patient was not able to tolerate the ventilation scan, but the perfusion scan showed that the left lung was receiving 96% of perfusion, whereas the right lung was receiving only 4%.